The News Time Magazine WordPress Theme has been built with love using the latest HTML5 and CSS3, jQuery techniques with a validity code, completely responsive to look perfectly in all mobile devices, easily usage with any device as well . Responsive design optimized for tablets and smartphones, resize your browser and hit refresh to check it out. 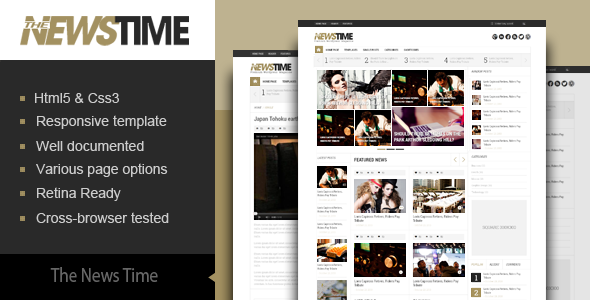 Item Reviewed: The News Time :: Magazine WordPress Theme 9 out of 10 based on 10 ratings. 9 user reviews.